Fires and fire alarms in multi-residential housing (especially university dorm rooms) are more often than not caused by microwave ovens. Microwave fires and, almost as importantly, the false alarms caused by burning food, popcorn, etc. in microwave ovens has been, until now, an unpreventable fact of life. University Logistics is proud to announce the introduction of a new product designed to prevent microwave cooking fires and the nuisance calls & tenant apathy associated with false alarms. Fact: Cooking fires are the number one cause of household fires. Fact: Fires are the number one safety concern in multi-unit, multi-family dwellings. Fact: Technology has products that will help prevent BOTH these types of fires. Pioneering Technology created the Safe-T-element® cooking system, a product engineered to help prevent stovetop cooking fires before they start addressing the number one cause of household fire. Fires and almost importantly fire alarms in multi-residential housing (especially university dorm rooms) are more often than not caused by microwave ovens. Microwave fires and the false alarms caused by burning food, popcorn, etc. in microwave ovens have been, until now, an unavoidable, unpreventable fact of life. Pioneering is proud to announce the introduction of a new product designed to prevent microwave cooking fires and the nuisance calls and tenant apathy associated with false alarms. By combining current smoke sensor technology with current electronics technology, Pioneering has made this a reality. 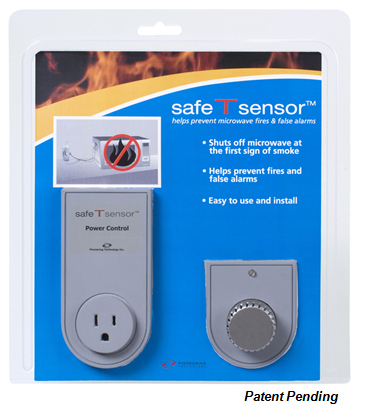 The “Safety Shutdown” consists of a smoke sensor (similar to those used in smoke detectors today). However, instead of wiring the sensor to an alarm, siren, or relay to trigger an alarm, it is wired to a relay to cut off the electric current to the microwave, stopping the cooking, stopping the heat source, and preventing the fire. Microwave fires begin slowly. They “heat” the item inside the microwave. As the item gets hotter it can begin to burn. The basic path of a microwave fire is heat, smolder, burn, combust. Pioneering’s system will shut down the microwave, at the smolder stage, before combustion can occur and before sufficient smoke can be generated to trip a fire alarm system.